David Pogue reviews the $100 laptop. Personally, I feel that Comcast offers the best product (assuming everything is working properly) that is available in my area. I’m no longer a customer, but I was very happy with the company when I was. However, I am getting more and more disturbed the more I hear about Comcast’s packet forging. While I understand the need to keep illegal content from being passed over their network, I fear the growing trend of controlling the content that is being passed. Is it really up to Comcast’s discretion? How long will it be before we need Comcast’s permission to use a certain protocol on their network? Will we soon see a ‘protocol blacklist’ posted in the Comcast user help section of Comcast.net? I mentioned Steven Fossett and the Amazon Mechanical Turk previously, and seems to have been some progress, even though the search continues. Steve Fossett, the millionaire adventurer, has been missing for days and now Amazon Mechanical Turk is being used to aid in the search. Yet Another iPod Touch Post: I’ve Been Converted! I have not bought an Apple product since about 1985, and even, it was my dad that bought it because my allowance was only a dollar a week. However, after today’s iPod Touch announcement, I will openly admit that I want one! What changed my mind? Integrated wi-fi. Although it’s basically an phoneless iPhone, this is still serious business. You’re telling me that I can carry my music and access my web apps on the same device? And that it’s software is upgradeable through a software push so it’s likely that there will be new apps added in the future? Plus it’s got the multitouch screen and over 20 hours of battery life. Sold! Tom Krazit from CNET’s Crave blog did a really nice live-from-the-event post (which is where I got the photo from) with down to the minute details. Check out his post and my thoughts here. Note: You have to read my annotations from the bottom up, since that is how the timeline runs. You’ll see when you get there. I’m a bit disappointed about this news. Palm is evidently nixing its Foleo product due to expensive bug fixes and lack of public reaction. I rather liked the idea behind the Foleo. Why carry a computer with you when 80% of the time you only use 20% of its capability? I actually would welcome the idea of computers being replaced by component machines that speak with each other. I posted about the Foleo earlier. A few months after its introduction, the Palm Foleo has been canceled in its first generation. go. See the initial write up here. 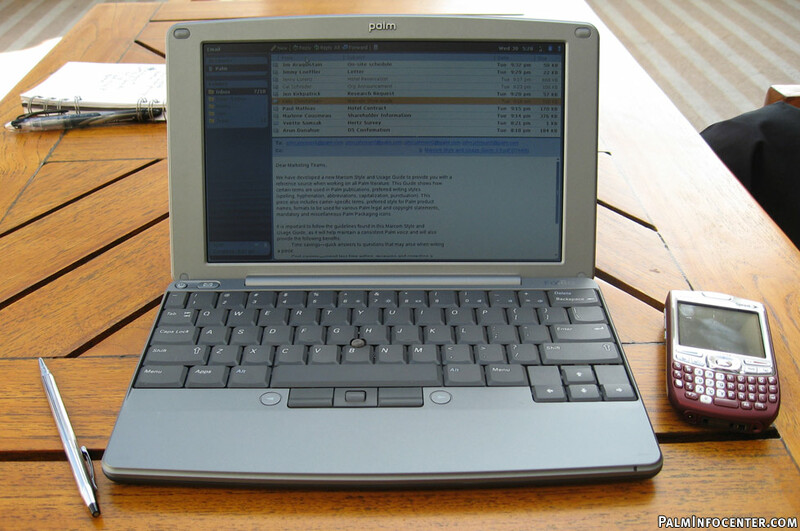 including the newest version of the Palm OS, which is now Linux-based. in the works. Hopefully this will be better priced and more practical. Microsoft, which is rumored to be in talks with BlackBerry for an acquisition, and Google are both ramping up their mobile efforts as well. Could More Efficient Processors Help Save Our Planet? A friend of mine forwarded me an article looking at the power efficiency of Intel and AMD processors. The article is interesting in that it points out how correctly configuring your machine maximizes its efficiency. There’s an environmental side here too. More efficient machines use less energy. Data centers full of efficient machines could play a large role in a company’s role in protecting the environment. Less energy use = less carbon being spit into the air. In today’s data-driven world, this efficiency goes further than short-term cost savings. Maybe it’s time we hear more sales presentations based on environmental savings instead of dollar savings. Please read the article, along with my thoughts, here. person’s location using OnStar’s embedded GPS. freaking gorgeous. Here are the top 10. Surround yourself with people smarter than yourself. It can only breed success. More often than not, people sit on great ideas. Don’t be one of them. start-up and about your ideas. Innovate. Innovate. Innovate. You might have a great idea today, but will it be the same tomorrow? comes with being an entrepreneur. enlightenment, says Thurman, is our first step toward becoming Buddha. The mapping app has become a powerful tool for nonprofits with global messages about saving forests–and lives. Green Six will plant 6 trees for every person who signs up for a sneak peek to their beta site. week they announced their stellar new product, the Foleo fake laptop. Seriously…this is a joke, right? If you take a moment to view the presentation on Palm’s site, and I mean the full presentation, you get a pretty clear picture of where Palm founder Jeff Hawkins is going with this thing. And I’ve got to say, I think that he’s right. Smartphones are already becoming our communications hub. It’s with you all the time. You go home and sync it with your computer. You go to work and sync it there. And you sync it with your laptop when you travel. And by now, it’s got three quarters of the capability that your laptop has, plus it probably houses half your mp3 collection and photos of your last vacation. My thought is that Hawkins sees a future where we work by proximity. We put our handset with range of some device and all our information is available to us on that device. are you really going to spend that much money to supplement your phone? What Graham doesn’t seem to get is that this is not a “supplement” for your phone. This is the future of your laptop. Face it. Your laptop is a brick that is full of features that you never use. This is exactly why, when my IBM Transnote died, I bought a Nokia 770 Internet Tablet instead. I examined the way I used my last machine and realized that I didn’t need all the “stuff” that the manufactures try to sell you on. And now that I’ve bought a device that hosts just the features that I need to do my job, I’m suddenly a lot more productive. Imagine that! Right now the market for this sort of device is slim. Compare it to the internet table market or the UMPC market. But companies are investing because there is a future to these markets. Hawkins makes it clear that the Foleo is a product line, not an accessory. I see being able to walk up to a desk, or a kiosk, or a podium anywhere, and having your vital information at your fingertips with little or no effort on your part. I’m not quite certain what Graham sees.